The pure power forward position seems to be somewhat of a dying breed in the NBA today. Many teams are utilizing forwards that specialize in a single area like primarily rebounding, blocking, or scoring, but the combination of the all-around pure power forward hasn’t been seen as often as past eras. 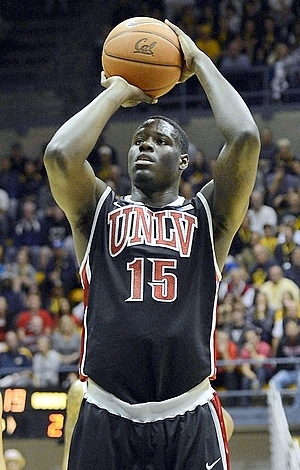 UNLV big man Anthony Bennett is bringing some love for the less often seen position back to the league, proving to be the best pure power forward in the draft class and drawing comparisons to the Cavaliers’ Tristan Thompson. Not only are both guys built alike (6’7″/6’9″, 240lbs/227lbs), but both started their journey in Canada and declared for the draft after one year of college. With what he’s bringing to the table, Bennett may also find himself being drafted in a similar position as Thompson. When it comes to his game, Bennett’s athletic build is close to Jason Maxiell’s while his style of play reflects much of what Zach Randolph likes to do. There’s no debating his favorite area on the floor is the paint where he can go into his power game where he is virtually unguardable. His mid-range face up is deadly, especially his go-to baseline jumper, but to compliment his sound shooting mechanics his footwork will work any defender as he’s also proficient shooting off jab steps, finishing dunks, reverse lay-ins, and tip-ins. Although his overall size is a slight issue, he consistently proves to be a mismatch on the offensive end with the ability to overpower smaller guys and speed around bigger players. Versatility is definitely one of Bennett’s high points, evident in his three point shooting capabilities (good for at least one per game), handling, and free throw shooting (75%) which is always a trait sought after in big men. We mentioned his size is not a tragic issue, however, Bennett’s stature is undersized for the typical forward, but also too large to play the small forward spot where he seems to be too slow defensively. Another concern is his strength. It’s not a question of whether he has enough strength, but how he uses it. Despite being a dominant power forward Bennett is notorious for shying away from contact and not battling hard enough for rebounds. In addition to those mild problems, Bennett’s health and injury problems are his biggest worries. The last two seasons of his prep school career were eliminated by injury, yet he’s been fine in college, so at least it’s looking good. Being the best power forward this draft offers, Bennett is more than likely going to find himself taken by the Phoenix Suns at the fifth pick, one pick after Tristan Thompson was taken in the 2011 Draft. If he ends up playing the hybrid forward position the Suns could have him on the floor with Luis Scola and Michael Beasley which is rather appetizing. If he ends up falling past that spot it’s a toss up whether or not he’ll be used as a bench role player, but he really has the talent to earn a starting position. This entry was posted in Home, NBA Draft and tagged 2013 NBA Draft, Anthony Bennett, basketball, canada, Cleveland Cavaliers, jason maxiell, luis scola, michael beasley, NBA, NBA rookies, Phoenix Suns, tristan thompson, unlv, zach randolph by congetz. Bookmark the permalink.